Diva Devotee: Does Aretha Franklin have cancer? Does Aretha Franklin have cancer? Though I'm loath to quote the trash that is the Daily Mail below is an article by them claiming that Aretha Franklin's recent unspecified surgery was in fact to treat aggressive pancreatic cancer. Here's to hoping that this story is one that the Mail has fabricated, or at least exaggerated (something they are famous for) but whatever the case may be we wish Ms Franklin a speedy recovery and good health. Is Aretha Franklin suffering form cancer? 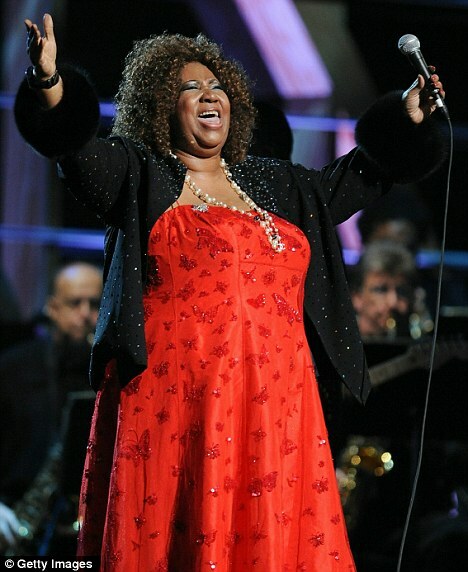 Legendary motown singer Aretha Franklin is battling pancreatic cancer according to reports released today. The 68-year-old star recently underwent a mysterious surgery but had kept silent over the exact cause of the operation.It is now believed that she was given the diagnosis of the same cancer which killed Patrick Swayze and Michael Landon. Queen of Soul: Aretha Franklin has been diagnosed with cancer of the pancreas This type of cancer has only a 5 - 10% survival rate. Due to Aretha's age, weight and existing physical conditions, her chances of survival are further lowered and the star is said to have hid her prognosis from close friends and family. It's getting to be where you can hardly believe anything that you read anymore, but most people believe anything that they hear or read. For instance, this article called Aretha a Motown singer. Aretha has never been with Motown; EVER. So that says it all. Why would I believe anything else that they print.